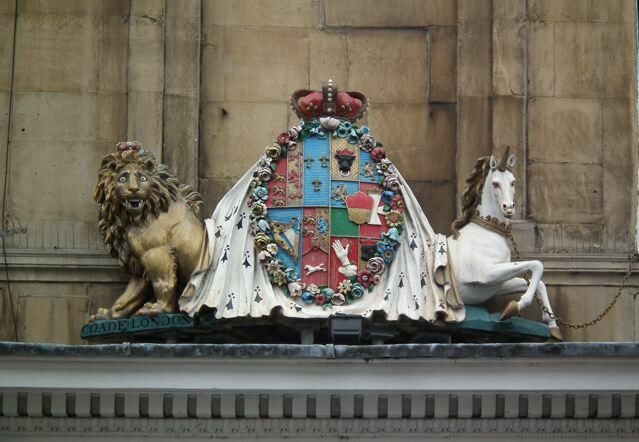 There was a neat post recently about some Royal heraldry over on Philip Wilkinson's blog English Buildings. The particular building he was highlighting that day was a shop front near Pulteney Bridge in the City of Bath. What caught his attention was the coat of arms over the shop window. As he notes, the arms are those of "Queen Charlotte, consort of George III, who visited Bath in 1817, the year before she died. ... The highly complex heraldry combines the arms of the British royal family [to dexter, on the left-hand side as the viewer sees it] with those of her father, who was Duke of Mecklenburg-Strelitz [to sinister, on the right]. The amount of detail on these three-dimensional arms is staggering – all those harps, bulls' heads, fleurs de lys and so on in low relief, and the extraordinary garland of flowers around the central panel. The lion and unicorn are real characters, the former astonished, long-maned and well fanged, the latter realistically equine."